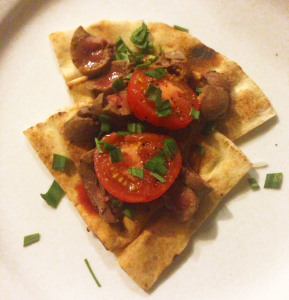 Toasted pita topped with slices of lamb kidney with tomato and chives. While waiting for the bus when we were going to school, we would get our daily snack wrap of what ever it was that the person on the side walk was grilling that day—like grilled goat or lamb kidney, heart or liver & tomato with a squeeze of lime with parsley in naan. The bus driver would scream & shout at us that the juices coming out of the wrap would make his bus dirty & we would take bites & just stare at him as if really? And you call this bus clean!! I can still remember those sensational flavors which are my guide on what I cook today. This tasty offal appetizer has been featured on our Changing Prix Fixe Menu earlier this year. In the Zing! By Gorji cookbook there is another recipe for duck heart in ragu with smashed potatoes. Make comments below. How have you had kidney, heart or liver prepared? 2 Replies to "Street Food:Lamb Kidney Wraps"
I had this the other night… the tomatoes were awesome!